Always mindful that the next generation will one day become the guardians of the countryside, Suffolk Owl Sanctuary is always keen to take part in the regional Schools Farm and Country Fair, which is held locally. 2015 marked the 12th. year that this event has been organised by the regional agricultural association, engaging schoolchildren and their teachers in all aspects of farming, food production, conservation and the countryside. 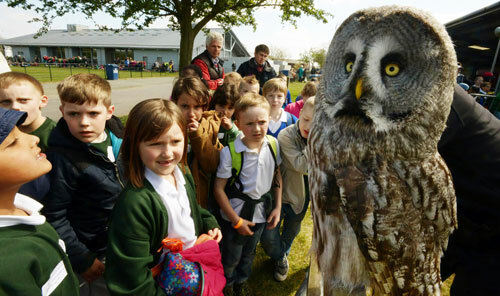 Suffolk Owl Sanctuary’s falconers, owls and other birds of prey played host to 4,000 children aged between 7 and 9 years of age during the course of the day! This enormous fair is now firmly established as the premier schools event in our farming county where pupils can meet farmers and conservation and countryside experts to learn about all aspects of their rural environment. Each school is paired with a farmer steward who acts as their guide and enabler for the day, talking them through the various activities and explaining exhibits. Suffolk Owl Sanctuary staff introduced the children to Spirit the Barn Owl and Dodge the Kestrel, and explained the importance of wild birds of prey as an indicator of the state of their surrounding habitat and the wider environment. Teachers attention was drawn to the fantastic facilities on offer to school groups on a trip to the owl sanctuary and the variety of S.O.S. resources and activities which are available to support the curriculum, including owl pellets for dissection, class games, craft projects and worksheets. The Sanctuary’s junior newsletter, the “Stonham Screecher” was also popular with children and adults alike. (You can download a free copy of The Screecher here.) The children were also able to witness a demonstration of falconry in the show’s main ring as well as sheep shearing, gun dogs and ferret racing. This event afforded the Sanctuary another valuable opportunity to meet local schoolchildren and inspire their interest in owls and conservation - reinforcing the messages that, over the course of the last year, have been delivered by S.O.S. to a record 2,300 pupils throughout Suffolk on school visits.